It is said that every piece of music tells a story. The music of Laco Deczi does just that! Then there is the magic of Chris DePino on chromatic harmonica. And so the story grows. Band mates Eric Meridiano on piano, Vaico Deczi on drums, and Japanese superstar Nob Kinukawa on bass provide all the rhythm and backup needed to make this a most special CD project. "Julia" is a beautiful ballad about the life of Laco's manager in the Czech Republic. It is filled with the love and kindness two people have for each other in the crazy world of making music. "Sunday Morning" is a refreshing score of notes and lines of smooth jazz spoken with the artistic mastery of Chris' harmonica. Once in his travels Laco met a beautiful woman with a gorgeous nose, of all things. Thus we have "Prshak," the nose that catches the rain. Up-tempo and lively it brings one the feeling just how the rain falls on summer days. Since Laco lives in America near the water, "Sand" is a samba with spirit and Latino form. Chris' harmonica lines sing through the entire song . . . moving quickly past emotions caught between the sand and the sea. "St. Jude's Children" provides the beautiful lullaby Laco has written for those children who are ill from the curse of leukemia. Laco himself has a friend who is experiencing this disease and it is for the children of St. Jude's Hospital that we dedicate this wonderful song. "Carton" comes by way of Laco's studio and the wonderful musicians of the Celula New York quartet. 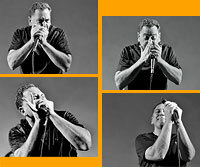 The music screams of biting rhythms with clean horn lines surrounded by blues harmonica at its best. 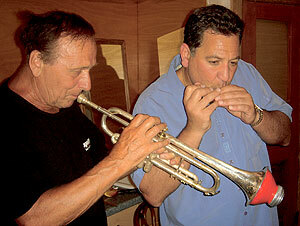 On "Pino Blues" DePino stretches out again to another Deczi composition with Mr. Larry Johnson following right behind. Johnson's moving gospel vocal shakes the blues on this song right down to the bone. The sparkling clear guitar of Joe Tinari shines on two compositions, "Tinari" (named after Joe), and "JoAngela" (a song for Chris' daughters). The guitar and harmonica have always been best friends and on these two songs we now know the reasons why. And finally there is the moving ballad "Forest." If you close your eyes you can see the footprints of a day walking in the forest filled with the colors of life. . This composition is one where Laco brought all the elements of harmony together with Chris' soulful harmonica. It is one of our favorites! So for the life lovers everywhere, we dedicate these songs. We hope you enjoy the music as much as we did creating it for you.